← I just love Tapsilog Bentos! I promised myself to cut back on buying bento supplies because honestly, I have enough usable boxes to last me a whole month (well, weekends not included) without having to repeat any. Iâ€™m that bad with purchasing boxes. But when I found a few affordably priced boxes locally, I had to give in. So Manila-based bento people, read on as I share a few of my latest bento finds. Versatile and very useful, I love bento belts because a lot of my boxes donâ€™t have Tupperware or Lock & Lock seals. While they donâ€™t spill, the bento belt adds an extra measure of security and stabilizes your boxes, especially tiered ones, for transport. 88PHP for a pack of 2 belts. Hatchin regularly stocks different things on rotation. Last time I was there, (after a tip by reader Mila) they had Heart & Star Egg molds in stock. While I donâ€™t eat hardboiled eggs on a regular basis, it was cheap enough to justify purchasing. Bento blogger Jenn from Bento Yum recommends using egg molds as onigiri and mashed potato molds as well. 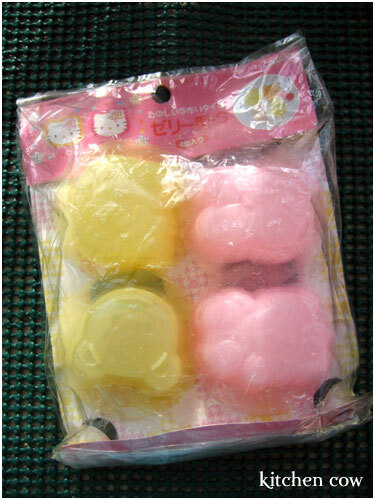 60PHP for 2 molds. I love these things so I picked up an extra set. Theyâ€™re perfect for adding little amounts of food in liquid / sauce like thick dips, spreads, and liquidy stuff like fruit cocktail. In case the liquid is runny, stretching some cling wrap on top works wonders. And because theyâ€™re reusable, youâ€™re doing your bit for the environment. 55PHP for a set of 6 cups. New Hatchin Grocery also has nigiri molds in various shapes (from plain triangles to fancy shapes), fancy chopsticks, tiered bento boxes, and baran (sushi grass!). Seasonal products like weiner cutters and vegetable cutters are also available. See? No need to spend a fortune on ebay to get pretty boxes. You can get them cheaply if you search hard enough. Iâ€™m sure other cities also have their own bento finds, all it takes is a watchful eye and imagination. Still canâ€™t find what youâ€™re looking for? Need something extra special? If you’d prefer to order online J-list / J-box has a nice selection of bento boxes you can choose from. This entry was posted in bento box review, food shopping. Bookmark the permalink. may use din pala ang gift gate. hehehe. Kamagong! We used to live there! Where *is* this Hatchin place?! Where can I buy a set of reusable chopsticks like those decorated ones in your past entries? Aside from the stores Ryan mentioned, you can also check out Hatchin (check comment below for directions :D) and Okame Japanese Grocery at Park Square in Makati. Hatchin also sells the soy sauce fish containers like the ones Karen is looking for. I also got the collapsible sandwich box at Japanese Home Center recently, very useful for lunches. 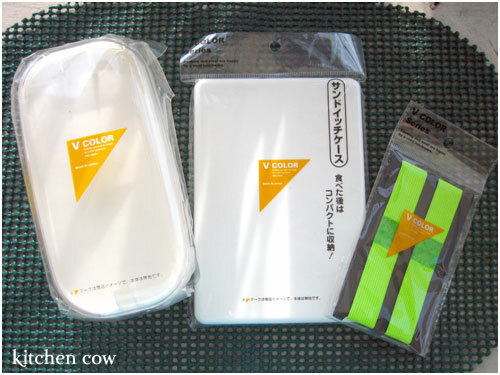 The brand Vcolor has a lot of interesting stuff, im going to need to buy a few for future use. Hey Kaoko, it’s not weird for a guy to want to try making bentos, is it? Hahaha, it’s funny. I feel the same way about gift gate too. When we were kids, I remember being allowed to pick something out from gift gate was a treat because all their stuff, being genuine Sanrio from Japan was so expensive. Now, it feels like sifting through a garage sale. Still, I make it a point to look for possible bento stuff. Sadly, last time I was there, they were still out of soy sauce fishies. But you know, maybe it’s possible to ask them to buy some? I mean, they usually stock it anyway. Either that or buy their pre-filled soy fishies but it’s sold in large boxes! Hnnn, it’s at a street corner. I’m not familiar with the street names, but it’s across a Banco de Oro branch. When you’re going through Ayala, coming from Edsa, take a left after the Meralco office, and it’ll be a block down on your left. Heehee, fun fun! I love bento box shopping 😀 I wish I could say the same thing but I’m consciously trying not to. Yeah! VColor is nice. And I like how, despite the name, it’s all plain white 😀 I’m thinking about embellishing mine with stickers but I haven’t found a design I like yet. Course not! And it’s really fun, once you start, you won’t look at food the same way ever again. I know some of the bento posters on the bentolunch community at LJ are men, so you won’t be alone. ….. or was it at this shop at trinoma? i quite remember…. hmmmmmmmm…..
It’s in San Antonio Village. Iâ€™m not familiar with the street names, but itâ€™s across a Banco de Oro branch. When youâ€™re going through Ayala, coming from Edsa, take a left after the Meralco office, and itâ€™ll be a block down on your left. I think it’s Sacred Heart something? It’s along Kamagong I think but I’m not perfectly sure. Aaah why is it that I never find anything when I go to these stores? Haha. Bad timing I guess. Thanks for posting this! if you can’t find the bento supplies, why not be creative and try other supplies? like those disposable and re-usable microwavable containers that come in black and clear plastic? or how bout your trusty old tupperwares =) kaoko i really cant remember where i saw those stickers… but i definitely remeber where nina bought the cow spots steering wheel cover =D at the everything P 55 store at the ayala mrt station… wait.. i think they have cow stickers there too………. S’allright about the stickers. I collect cows but I don’t think I’d want to totally go out of my way for them. Ohmigad, I bought the same egg molds on New Hatchin! Thanks for sharing, I’m always on the lookout for bento stuff. Unfortunately, the only bento boxes I found on Hatchin are the white transparent ones. Might buy a lot of bento stuff from Hong Kong, will let you know. Unimart in greenhills is selling 2 collapsible sandwich boxes for P88! Last time I saw the pink ones, they’re on the shelf at the left, along with the chopsticks, and utensils, the one which has a staircase behind it? (Left if you’re standing at the main section of the store and facing away from the prepared food section. It’s easier to find it if you look for the staircase though.) Hong Kong’s a lovely place for bento stuff I hear. All the Sanrio and San-X boxes! Waaaaaah! Greenhills is so far from me. Do they have other stuff as well? I’m so addicted to those 88 Peso stores, I keep my eyes peeled for possible bento / doll-related (my other hobby) stuff. They don’t have a lot, more of a small table of japanese household stuff. For variety Japan Home Center still the best, but I saw the collapsible boxes and was thrilled to see they were 2 for 1. What I wish they had were egg molds. Am addicted to making eggs in shapes! Hehehe. Did you know that in Japan, they have QUAIL EGG MOLDS? Soooo want them, but it was unreasonably pricey on ebay. Crossing my fingers that it’ll show up on Japan Home sometime. Japan home center?! Where’s that? Japan Home Center is a chain of 88PHP stores, fashioned after 100Yen stores in Japan, and selling mostly the same things. There are a lot of them in Manila, usually in the more popular malls. Where are you based so I can point out the closest branch? I’m based between some major malls like SM North and Megamall. Officemate who lives in the SM North area says the closest one she could think of is at Gateway, beside the DIY center. She can’t think of any others since she usually visits the ones at Makati. Sorry can’t be of much help. She did mention a couple of noteworthy stores at St. Francis Square that sell cute accessory kind of items, i.e. little food picks, chopsticks, etc. <3 <3 <3 Can never leave without buying something. I mean, dollar stores / 100 peso stores are nice, but Daiso / Japan Home are notches above like stores. check out the 55 peso store at the ayala MRT station. That’s where nina and i got the cow spot steerign wheel cover =) htey have loads of reat stuff i found some really nice stainless steel wine bottle stops. Hey! Thanks Ryan, I’ll check it out soon, when I visit SM to pick up more craft supplies. Remember that Pinky meet at Starbucks? I actually left a small plastic bag of craft trimmings (tiny fur boa, pearl look-alike beads, etc) at Starbucks. And by the time I remembered, you guys had left already! Bleh. Hi guys, i’m new here. Any other location of Hatchin’ or japanese grocery aside from makati? the place is not accessible for me eh. Hi Tara! Where are you based? I’m familiar with Japanese restaurants south of Manila because that’s where I’m based and can ask around for locations of those in the QC area. i really want to have that egg mold. really? sent you a message through the contact form. nahihiya man ako but I really want that mold badly. hehehe. thanks kaoko. luv your site! i started making bento just last summer. do you know if there’s a store in qc that sells eggmolds??? Glad you’re finding it useful, Pebbles! Is there a My Dollar Store near you? I found some heart and star egg molds there. There are still some here at their ATC branch. If you really can’t find any, I can grab some for you then just ship it off. 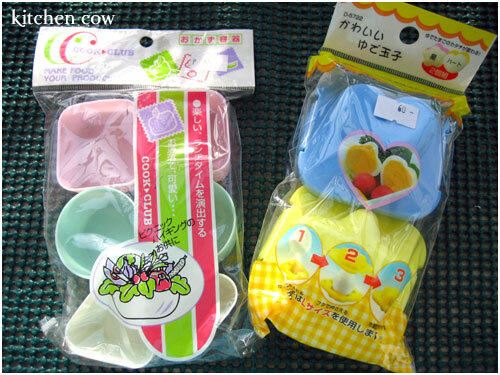 Just went to New Hatchin this afternoon and they had the bear, bunny, heart & star shaped egg molds in stock Unfortunately, they didn’t have any bento boxes or the plastic divider cups. I have stuff for sale! I just haven’t finished fixing them yet but I’ll have a stash of brand new, unused bento accessories that I hope to put up this week. Oh goodie! Maybe we can meet up in Makati. I have a friend coming to visit from Canada and I asked her to buy me some bento stuff too Haha.. somehow, this reminds me of that garage sale scene in Confessions of a Shopaholic. In our case, it’s bento shopaholics! It is only now that I stumbled upon this site. I adore each and every bento. I am a baon addict and am now inspired to create cute bento. Thanks!